My favorite subject, both to learn and to teach, is history. This calendar year, for personal Bible study time, SJ and I are both reading through the New Testament, Acts through Revelation. I was especially excited for the opportunity to receive Drive Thru History® "Acts toRevelation". To be honest, I think Drive Thru History® is SJ's absolute favorite vendor ever! We received a three-DVD set, along with a full-color study guide. They all come in this handy cover, with a sleeve that slides over the case. There are two discs in front, and one in back, with the study guide attached in the center. You won't have to worry about misplacing the study guide! Acts to Revelation continues on in the New Testament from where The Gospels leaves off, following the early Christians from Jerusalem at Pentacost through Paul's missionary journeys across Asia Minor, and ending with John on the Island of Patmos. For each episode, the study guide contains a summary; discussion questions; suggested passage to read from Scripture; Side Road, which is further information related to that episode; as well as full-color photos. Answers to the discussion questions are provided at the back of the study guide. Right away, SJ and I sat down and watched the first episode together, and went over the information for that episode in the study guide. Frankly, my intention was to watch an episode or two a week, and go over the study guide together. But SJ wasn't going to wait for that! 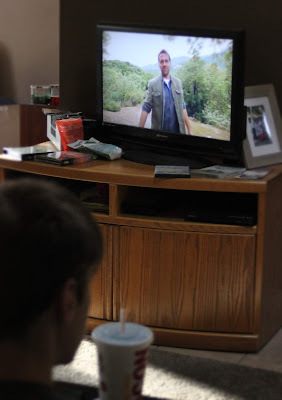 He watched several episodes at a time, while I was busy doing other things. He'd also watch at least one episode each morning while eating his breakfast! Because he finished the series on his own, I had to "play catch up," and did some binge watching of my own. We will probably rewatch together on a weekly basis, and go through the study guide, thoroughly, together at that time. We also shared with our church family. This past Sabbath, we watched the first episode after potluck. The young adults and older adults have been studying the book of Revelation in Sabbath school class since the beginning of January, so I know the episodes about John on Patmos, and the episodes about Revelation, will help bring that study to life. Yes, we are a small congregation. We were on a bit of a time-crunch, so had to start the video promptly at 1:30, which was before many people were finished eating even. So they straggled in as they finished with their meal. 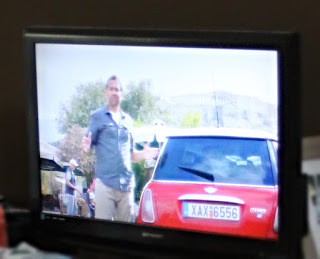 Our pastor has agreed to allow us to view them, one episode after our meal on each potluck Sabbath. Several members expressed their interest. Well, SJ's opinion: "I love it!" I have to admit: My sentiments exactly. We enjoy David Stotts' comprehensive information, both about location, and about history as it was during New Testament times. We also enjoy his humorous moments. Another thing we enjoy are the bonus features at the end of each DVD. (Yeah, we're geeky that way) Disc one has Behind the Scenes Interview: How We Started. Disc two's Behind the Scenes is Writing the Show. And disc three shares Behind the Camera. A year ago, we reviewed Drive Thru History Adventures (on my old blog), focusing mainly on The Gospels. But I know SJ enjoyed it so much, he watched everything that was available. What all does Drive Thru History® have available? Drive Thru History® "Holy Land"
Drive Thru History® "The Gospels"
Drive Thru History® "Acts to Revelation"
Drive Thru History® "America: Columbus to the Constitution"
I know SJ would be thrilled to have all of the DVD sets. Perhaps they'll become birthday gifts over the next couple years. If your family enjoys history, especially in video form, I am sure you will enjoy these series as well. 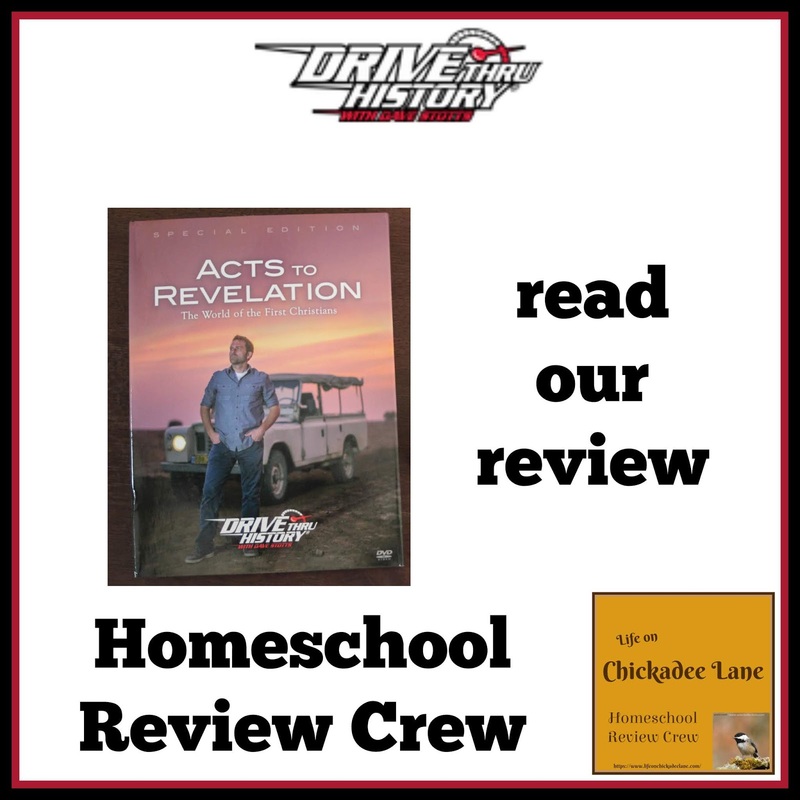 Several other families have been enjoying Drive Thru History® "Acts to Revelation" along with us; simply click the banner below to read their reviews.